America’s Cup skipper Jimmy Spithill has taken his foiling skills offshore with a three-day passage from New York City to Bermuda on board a 14 metre F4 catamaran. 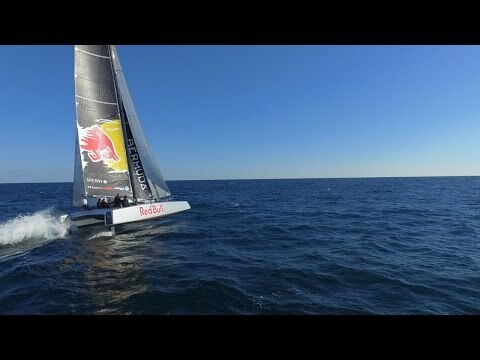 The Oracle Team USA star set off from New York Bay on November 5 to prove that foiling technology can be just as effective in the open ocean as it is for coastal racing. As the video above shows, the trip started in ideal conditions, but it wasn’t plain sailing all the way. After leaving the Gulf Stream, winds over 40 knots and seven metre waves tested the foiling catamaran, and its crew, to the limit. Spithill explained that this was ideal preparation for the 35th America’s Cup: “It was exactly what I needed, to really test myself under extreme conditions. The six-person Team Falcon crew was led by Spithill and included his Oracle Team USA colleague Rome Kirby, as well as Shannon Falcone, Tommy Loughborough, Cy Thompson and Emily Nagel, who will be competing in the Red Bull Youth America’s Cup. Spithill and Kirby will now return to Oracle Team USA duty, with the Defender set to line up at this weekend’s America’s Cup World Series Fukuoka (November 18-20).